If your pet runs off during a tornado and you cannot find it, don’t panic: Parts of it are probably high up in a nearby tree or power line. Keep a radio on during a violent storm. For those under thirty, a radio is essentially Youtube without the display. After the storm, when the media comes by, try to refrain from thanking God. I doubt you’d thank a person who destroyed your home, killed your neighbors and let you live only after a pants-wettingly horrific terror. If you live in a trailer, take shelter in the nearest sturdy building which will invariably be a Dairy Queen. After the tornado, check the wreckage around your home for body parts. If you find any of your own, you should get in your car and quickly drive at right angles from the nearest emergency room. Never take refuge under an overpass or bridge due to the danger of being eaten by a troll. 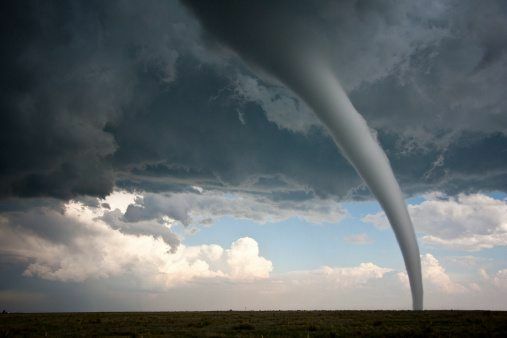 A tornado might be completely invisible. So, really, what chance do we have? Avoiding exterior walls gives one a much better chance of surviving a tornado. What gives one an even better chance is avoiding the tornado. Of course it’d be easier to head out at right angles if we still had those durn triangles . . .